As anyone who’s visited New York of late will attest, there’s no hiding 432 Park Avenue. The 96-floor tower can’t help but draw eyes as it soars 1396 feet over New York’s busy streets and almost all of its neighbours. But its interiors, on the other hand (designed by the newly appointed Dean of Yale’s School of Architecture Deborah Berke), those have been under wraps until now. When the interior renders were released in 2014, they gave an indication as to what would be found within the apartments. They spoke with the dignified confidence of such an iconic address yet with a freshness fitting their airy heights. 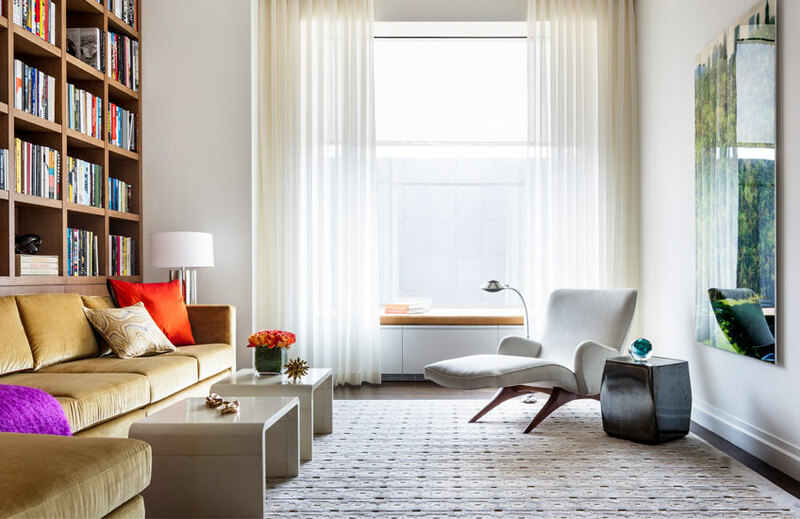 It seemed that 432 was destined to be a new kind of Park Avenue home with a nod to its past. A visit to the prestigious development confirmed that. A stunning show apartment has become one of the city’s most exclusive, must-see attractions for industry professionals and prospective buyers who excitedly ascend to the 38th floor via its private elevator. Partly dictated by its minimalist architecture and even more so by its key feature – that view – the building’s interior base build is kept understated. Floor after floor of well-proportioned apartments take the form of galleries with the ever-changing outside world acting as the canvases, as if a part-permanent, part-temporary collection. In the three-bedroom show apartment by Deborah, this aesthetic is honoured by interior schemes which are both captivating and enhancing. The living/dining room is a smart but cool environment – characteristic of the city’s duality – with composed mirror-image aesthetics and key art pieces. Two custom sofas in a spotted off white fabric face each other, bridged by two tub chairs upholstered in a geometric lattice weave. At the centre of the classic U-shaped arrangement is the ageless Yves Klein coffee table – its 3000 gold leaf sheets seemingly suspended in their glassy case. Sleek black consoles back both sofas as do graphic marble side tables. 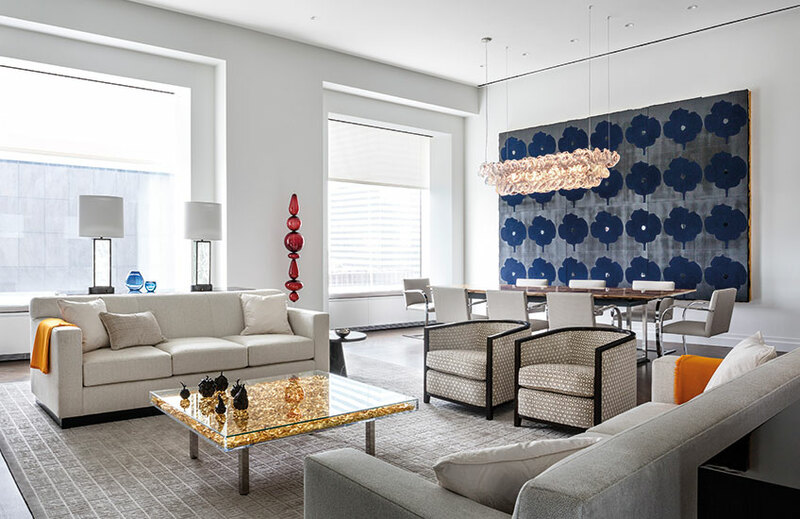 A Fortuny chandelier hangs above the dining table found in the corner and anchored by a large-scale Donald Sultan blue poppy canvas. Everything is light and fresh with strong design voice – just what you would expect from such a prestigious aerie. As is the view which is absolutely the apartment’s finest. Through the apartment-standard 10 foot by 10 foot window, the sprawling Central Park is the apartment’s key feature and makes the prospect of the upper floor views quite astounding. 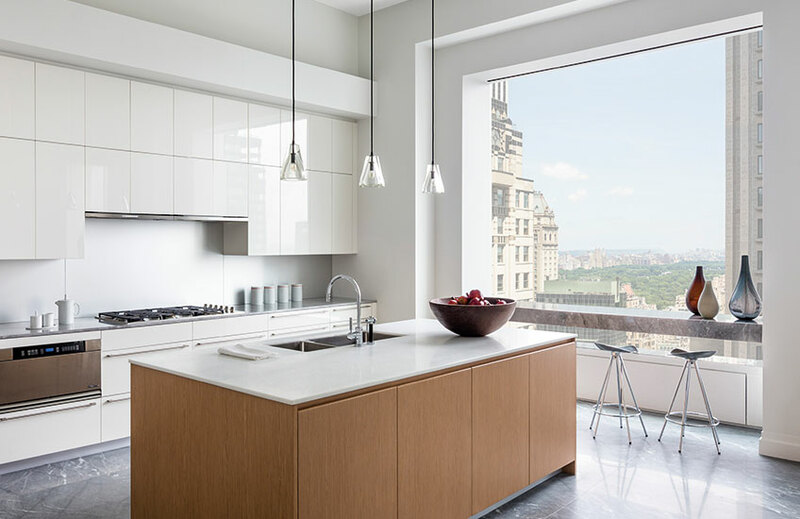 The view continues in the kitchen which features a marble breakfast bar, strategically and nonchalantly straddled between the generous window’s jambs. Blue de Savoie marble flooring (a kitchen-appropriate partner to the apartment’s elegant herringbone wood flooring) grounds the slick Italian cabinetry. The minimalist white lacquer and natural oak design is a Deborah Berke calling card and intimates of the masses of concealed storage found throughout the remainder of the apartment – a choice by the designer to maximise the space as much as possible and, even more importantly, to maintain the apartment’s sense of the serene. “The vision was to balance the scale and beauty of the windows with a layout that flowed naturally from grand spaces to intimate spaces.” Indeed, Frank Lloyd Wright’s “space is the breath of art” quote is referenced by the 432 team. Space has been carefully considered here by careful planning on Deborah’s part – even being created where typically it wouldn’t exist. Offering an alternative intimate space for informal entertaining and relaxation, the study doubles as another living room. Draped in light voiles and with a Lambda print called Central Park 1 by Korean artist Sangbin Im, the space is the epitome of an inner-city haven. And if the sinuous Vladimir Kagan chaise and buttercream corner sofa weren’t tempting enough, the floor-to-ceiling bookcase of design tomes most definitely is. Entering the bedrooms, one is overcome with a sense of calmness, often found in the work of Deborah Berke Partners. The earthy tones of the oversized padded headboard, lamps and bedside tables are, in part, responsible as is an expert use of the sky-high real estate. Built-in cabinetry makes the most of the apartment’s classically proportioned foot-space and allows residents to shut out the noise of “things” – the eternal struggle for those living in the city that never sleeps. And despite this careful use of the vertical and horizontal space (and its high status), the apartment feels remarkably grounded. Space, view, light and volume. 432 Park Avenue delivers on all of its promises. Residences are priced from $16,950,000 to $44,750,000.